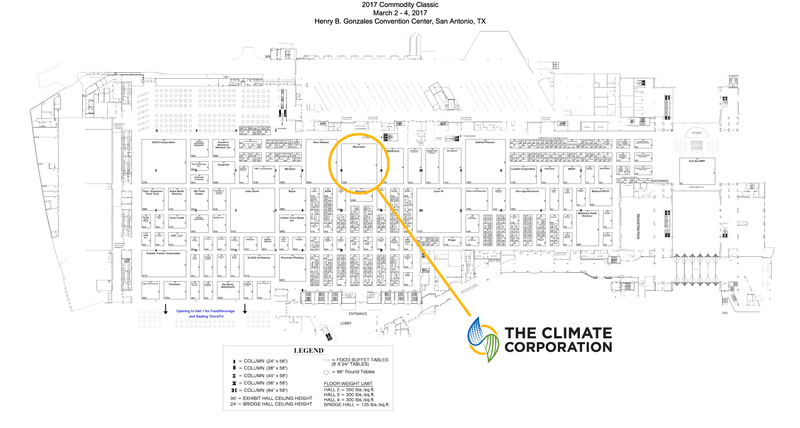 The 2017 Commodity Classic is March 2-4 in San Antonio, Texas and The Climate Corporation will be there to show what’s new in Climate FieldViewTM. Stop by the Monsanto booth, #2354 to learn more about Climate FieldView and talk with our experts. We’ll show you how Climate FieldView can help simplify data management, analyze seed performance and maximize your return with planting prescriptions and nitrogen monitoring tools. With the 2017 planting season quickly approaching, you can see how Climate FieldView will help you collect, view and store your field data as well as transfer your historic data seamlessly from other agronomic software applications. Stop by our discussion in the Monsanto auditorium on Friday, March 3 at 1:40 p.m. to hear about the newest features in Climate FieldView and how this platform can help you optimize inputs and maximize efficiency. You can also join us at the “What’s New” session we’ll host on Saturday, March 4 at 9:30 a.m. to discuss how Yield Analysis, Nitrogen Management by Zone and Advanced Scripting can help you manage field variability and optimize your inputs. In that session, Minnesota farmer Ben Fast will share insights on his experience with Climate FieldView on his farm. Be sure to follow us on Twitter @fieldview and check out The Climate Corporation Facebook page for updates throughout the show. The full schedule of events and event map are below. We hope to see you there!